As an athlete, mostly always in training for one competition or another, nutrition is extremely important to me. All of my coaches taught me the necessity of consuming some form of protein within thirty minutes of completing a training session. Enter tofu! I love tofu. It’s such a neutral food, a blank canvas, that absorbs the flavors of anything it’s mixed with. I have tofu frequently and use it as leftovers for lunches or as a snack after working out. Here is one the easiest, (only a few ingredients, most of which you already may have), quickest (takes only a few minutes to make), and yummiest (look at the pictures!!!!) tofu dishes I make: Sweet and Sour Tofu. 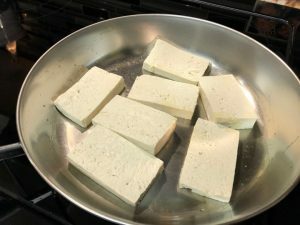 Tofu is usually packed in water, and must be drained for it to absorb the flavors of the recipe. I usually wrap my block of tofu in a kitchen towel and give it a good squeeze. Often I put a heavy object on top of it to force the water out of it. Slice the tofu in equal sized slices. 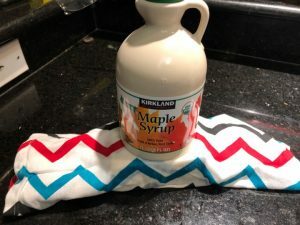 Next add the 1/4 cup of maple syrup and 1/4 cup of soy sauce to pan. Reduce heat if necessary. Flip tofu after a few minutes so both sides are coated. Cook until mixture reduces and almost caramelizes. Sweet and sour tofu can be used in place of meat in sandwiches, or served alongside a salad and potatoes. There’s no wrong way to serve this dish! This is so easy! Why not give it a try? 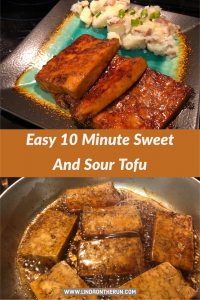 Have you ever made Sweet and Sour Tofu? Or, what tofu recipes have you tried? Do you like tofu? Please answer in the comments below! ← Getting to Know Linda on the Run! That looks and sounds really delicious! Definitely gonna try it! Thank you Melanie! Let me know what you think. I am sure you will like it as much as I do! Thanks Bendan.It is such an easy and healthy recipe! This looks so delicious. I have all the ingredients. Think I will try it this week. Good for you! Let me know what you think! OK. I’ve tried tofu a few times and I was not a fan. But, my son, who loves to cook, suggested I was using an inferior brand of tofu! Who knew? Well, I’m ready to try again. Can you recommend a particular brand/style (soft/firm/extra firm?) and where to find it in our area? Thanks, Linda! Colleen, back in the “old days,” I used to purchase my tofu at Whole Foods exclusively. 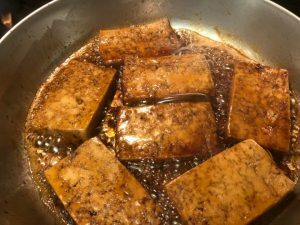 Now that vegetarian, and especially vegan, diets are more mainstream, quality organic tofu is also available at Publix and even WalMart. The firmness usually is dictated by the recipe. I personally prefer extra firmness in texture. 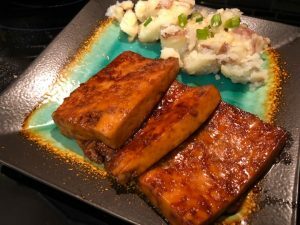 The tofu in the recipe pictures came from Costco (I purchase it in bulk!) and it is a softer sort of firm texture. It works well in all my recipes. Matter of fact, I am making tofu “scramble” for dinner this evening! Hi Fran! I didn’t know you were vegetarian! Yes, do try this recipe. It is quick and so delicious. Let me know how much you liked it! Yummmmm! So excited to see what you eat!!!! Hope to post a lot about what I make, kinda like you do!